30 Second Wine Advisor: What rhymes with Orange? Join our E-Mail service and be the first to know when the hottest new wines arrive! Spend LESS on the wines you love at WineLibrary.com!  What rhymes with Orange? There's a place in France where the local wine producers like to think they've come up with a word for it.  A message from WineLibrary.com Join our E-Mail service and be the first to know when the hottest new wines arrive! Spend LESS on the wines you love at WineLibrary.com! Rustic, somewhat awkward, yet pleasant overall, and good at the table; rare beef brings it around. The word "orange" has no exact rhyme in English, or so the legend goes*; but there's a place in France where the locals like to think they've come up with a word for it. In the Southern Rhone Valley, some of the more enthusiastic vine growers in the Principauté d'Orange might argue that their "Orange" rhymes with "Châteauneuf-du-Pape." In fact, Principauté d'Orange is a mere, humble Vin de Pays (a French classification reserved for vineyard land that lacks sufficient status or wine-producing heritage to rate the "Appellation d'Origine Contrôlée" moniker). Still, this good-size stretch of vineyard land that lies around the ancient Roman town of Orange ("Aw-rahnzh," in fractured French), lies not far north of Châteauneuf-du-Pape and shares some of its geological history, a prehistoric period beneath the waters of a greater Rhone that left behind fields of gravel and rounded stones. What's more, Orange makes its hearty red wines from some of the same grapes used throughout the surrounding Cotes du Rhone, including Grenache, Syrah, Cinsault and Carignan. That's sufficient similarity to give la Principauté d'Orange an intriguing selling point, and what more does a canny wine marketer need? What's more, while a good Châteauneuf will set you back at least $30 or so nowadays, and a great one two or three times that toll, it's hard to find a Principauté d'Orange (if, in fact, you can find one at all) for more than $10. Does it taste like Châteauneuf-du-Pape? 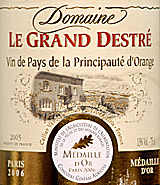 Well ... based on today's featured wine, an affordable Orange from Domaine le Grand Destré, I wouldn't want to push this analogy too far. Let's say that this Orange is to Châteauneuf as an orange Popsicle is to a freshly picked Valencia orange. * If you've got time on your hands and just have to learn more about words that rhyme with Orange ("Lozenge"? "Strange"? ), here are a couple of Web links to spend some time with.  Oxford Dictionaries: Are there any words that rhyme with orange? For those of you in the NY/NJ area, grab your tickets to the 2007 Super Tasting today! Click this link for full details! Sample over 700 wines from around the world ... all for one low price of admission! Just $85 per ticket! Monday and Tuesday, Oct. 8 and 9, at the Manor in NJ! Tickets are required. Start time 5:30 p.m. Click this link for full details! FOOD MATCH: Medium-rare, pepper-crusted rib eye steak makes a fine companion, taming the wine's tannins and bringing it into balance. VALUE: Excellent quality-price ratio at this under-$10 level, particularly as a food wine. WHEN TO DRINK: There's no particular rush to drink it up, but I don't see it gaining from further aging. Principauté d'Orange = "Prahn-si-po-tay doh-rahnzh"